肩こり、腰痛、膝痛なら、長野県下伊那郡高森町の整体院、『佐野カイロプラクティックオフィス』 ［患者さんの声402］　Very good value! I enjoyed your treatments very much and found them benefical. 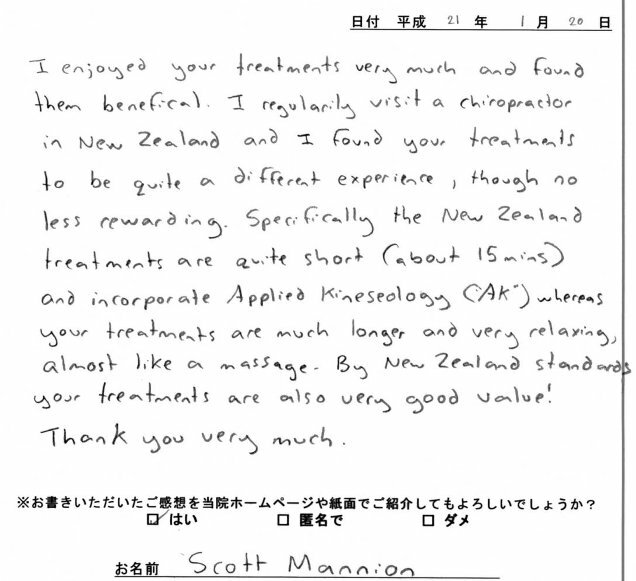 I regularily visit a chiropractor in New Zealand and I found your treatments to be quite a different experience,though no less rewarding. 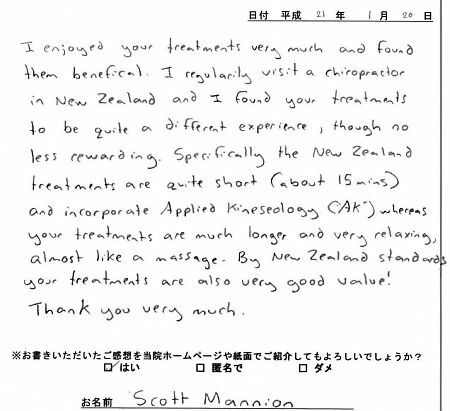 Specifically the New Zealand treatments are quite short(about 15 mins) and incorporate Applied Kineseology(AK) whereas your treatments are much longer and very relaxing,almost like a massage. By New Zealand standards your treatments are also very good value! Copyright © 佐野カイロプラクティックオフィス All Rights Reserved.